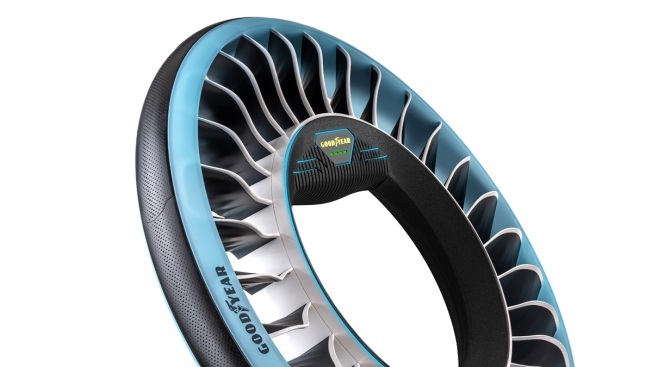 Goodyear's new AERO concept tires marry drone-like propellers to the traditional tire for cars that could drive and fly. Sensing a possible shift from conventional automobiles to flying cars, one tiremaker has come up with a tire that doubles as a propeller. Goodyear's Aero tire is designed to support the weight of a vehicle while driving and then tilt horizontally so its spinning bladed spokes can function as a tiltrotor to provide lift and forward propulsion for flying. Designed at a Goodyear facility in Luxembourg and introduced by the company Tuesday at the Geneva Motor Show in Switzerland, the tire doesn't actually exist yet, NBC News reported. The company calls it a "concept tire" designed to "trigger a debate on the tires and transport technologies for a new mobility ecosystem."